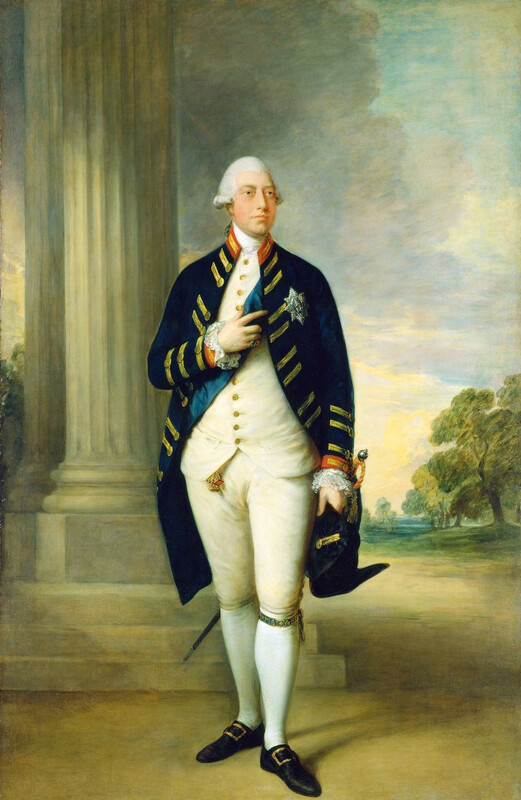 I love this portrait of King George. He has such a poor reputation, but if you had undiagnosed porphyria in an era when bleeding was supposed to cure all ills, you’d have a pretty rough time, too. Anyway, I love this portrait of him. In fact, it’s one of my favorite 18th century male portraits because he’s so simply dressed, but he’s wearing every piece of a true gentleman’s wardrobe, including the elusive fashion garter, pinky ring, and watch chain! 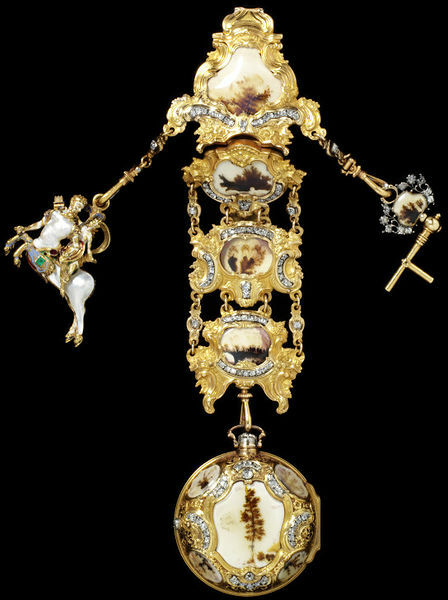 Though the watch emerged as the premier toy of the nobility in the 16th and 17th century, in the 18th century, watches became an indispensable accessory. 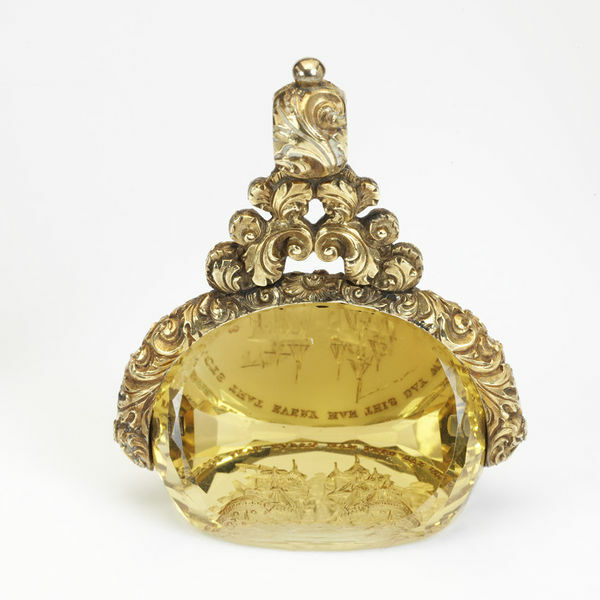 Not only were they tiny marvels and works of art, they also denoted fashionable scientific enlightenment– the transition from the ancient sundial to the mathematical precision of a rapidly industrializing society. Early watches were heavily ornate and often only had an hour hand. 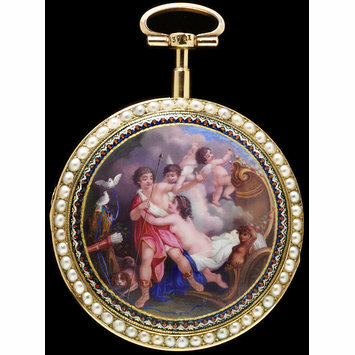 Thanks in large part to advances in enameling techniques, by the 18th century, decoration became more refined: smooth enamel scenes and repoussé cases contrasted beautifully with clean, white watch faces. Minute and second hands were introduced and complex calendar watches with multiple faces became popular. Early watches often only had an hour hand. 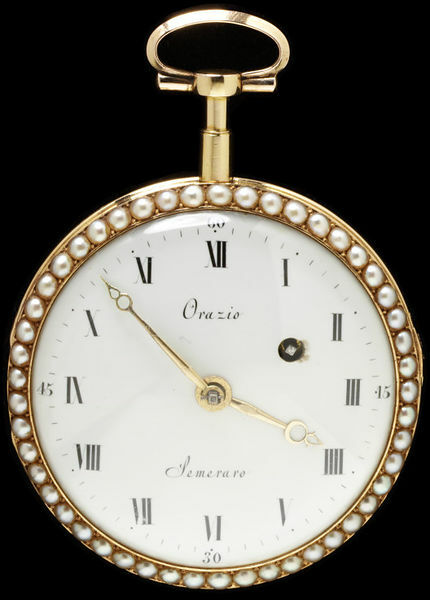 By the 18th century, minute hands had become standard and second hands began to show up on fancier models. 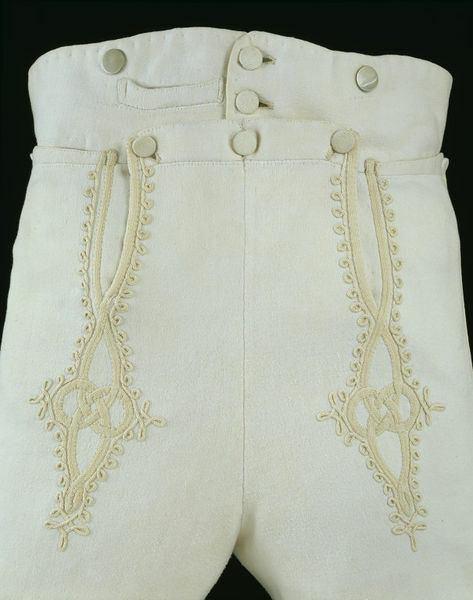 If you look closely at the waistband of the breeches, you will see the welt of the fob/pocket opening (you may have to expand the picture). 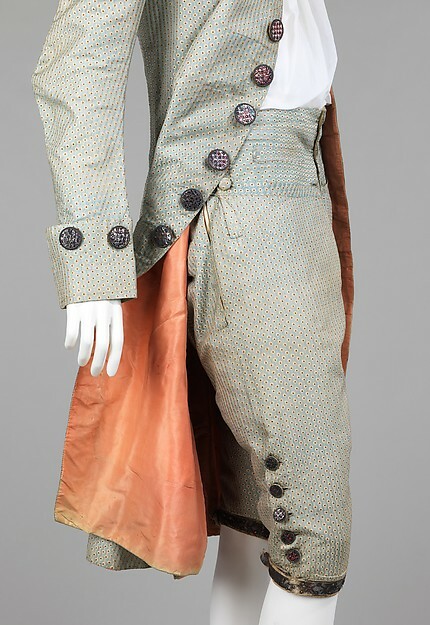 This suit is missing its waistcoat, which would cover the waistband and conceal the pocket. It’s easy to slip a watch into a tiny pocket, but getting it out can be much harder! A watch could be tucked into this pocket and the attached chain would hang out of the pocket making it easy to remove. The waistcoats of the 19th century were much shorter, so accessing the fob pocket was much less difficult. 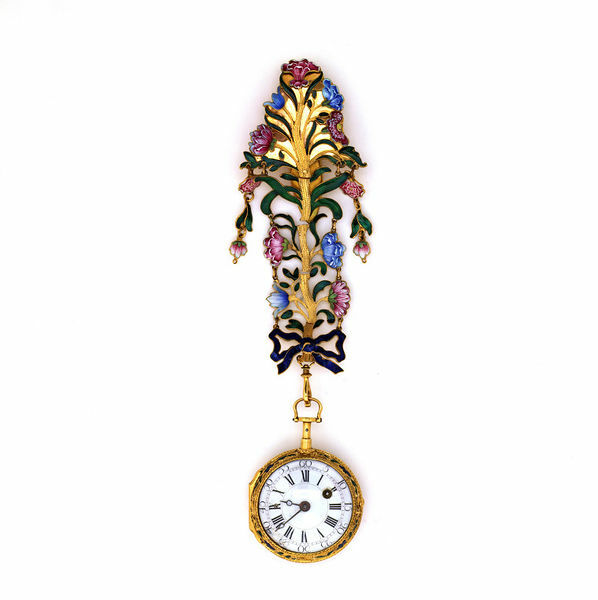 The watch chains of the era were much shorter, though the Merveilleuses kept the tradition of displaying lots of small watch charms popular. By the Victorian era, watch chains had become much simpler and remained so throughout the era. 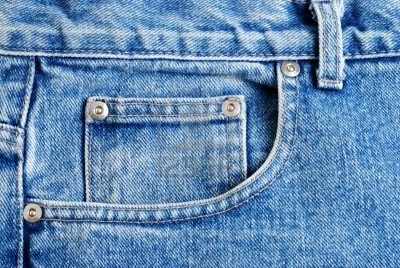 Modern pair of jeans with a small fob pocket inside the larger front pocket. Watch strings were more common than chains because they were less expensive and hardier. The image is terrible quality, but I love the fly fringe. Fly fringe for all! Watch chains held more than just the watch. Dangling from the ends, you’ll notice small trinkets. This little “charms” were actually necessary to conducting 18th century business and no gentleman of means would be caught without them. The two most common men’s accessories were the watch key and seal. The seal was used for sealing letters. In an age where paper correspondence was the only means of long-distance communication, letters were part of everyday life. Our current mail system is very sterilized compared to mail systems of the past. Letters were not handled by machines, but by people, some of whom might take an interest in what your private letter contained. A wax seal provided both proof of the sender (to avoid forgeries), but also added a tamper-evident seal. It wasn’t a perfect system, but adding seals to documents was an important part of law and etiquette. Watches often became separated from their keys over the years. Fortunately, unlike house keys, watch keys were fairly standardized, so you could buy another from a watch maker. Since pocket watches run on springs, it was important to keep your watch carefully wound in order for it to continue keeping time. Stem-wind pocket watches (the ones still in use today) were not invented until the 1840s. Instead, watches were wound with small watch keys. You’ll notice many pre-1850 watches have small holes in the face with a pin inside. This is where the watch key would be inserted to wind the watch. Pocket watches must be wound daily to keep functioning properly, so it makes sense to keep your key close at hand on your watch chain, just in case you notice your watch running down! There are multiple versions of this portrait and this dress (it must have been a favorite of hers). If you look under her elbow, you can see she is wearing a lovely watch and equipage. The word “chatelaine” is, like “fob,” a 19th century term. Most museums will list equipages as chatelaines in their collections. Equipages and watches in the first half of the 18th century were incredibly ornate like their 17th century ancestors. This particular equipage includes a unique accessory: a Renaissance pendant from the 1580s that was already over 150 years old when this equipage was constructed! The small rectangle container from the left dates to about 1730 and was used for snuff which both ladies and gentlemen indulged in. 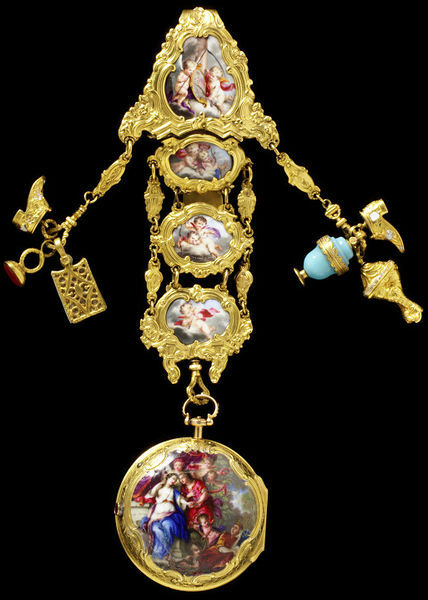 High-fashion equipages like this functioned as a charm bracelet of sorts for ladies of the court. They were almost completely decorative in nature and might not even have a working watch. This equipage has the classic watch-key-seal combination dressed up with gold and a plethora of gemstones! 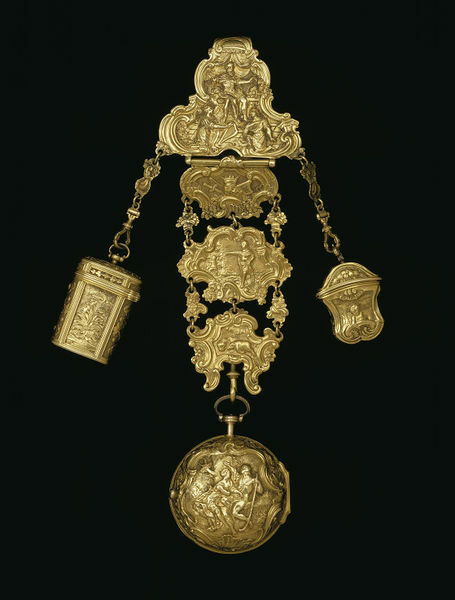 The museum lists this as a gentleman’s chatelaine, but it was probably for a lady since the watch is suspended at the end of the chain. Detail of Marie’s watch chains. Notice how hers are full of charms, but not necessarily functional watch accessories. The ever-fabulous Aristocat made her own versions, this time including a watch, which you can see here. This look is directly inspired by menswear of the period. 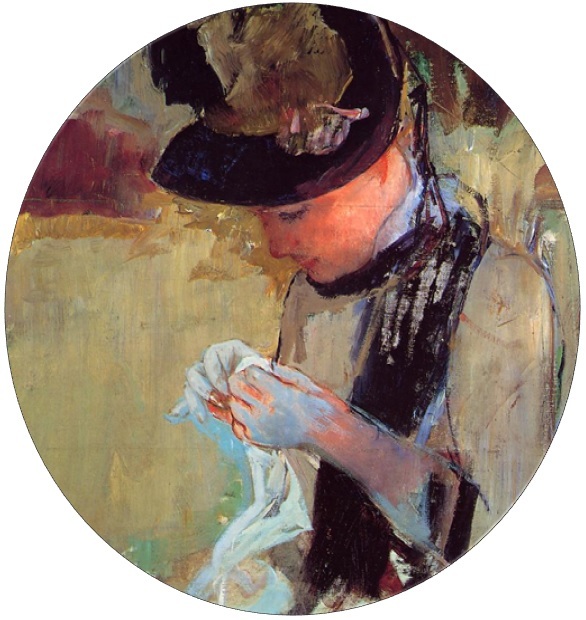 This is the only illustration I could find that shows this particular style being worn with an obvious watch– in this case, three of them! Some of them are likely fake. Just as precious jewels were imitated, so were expensive watches! 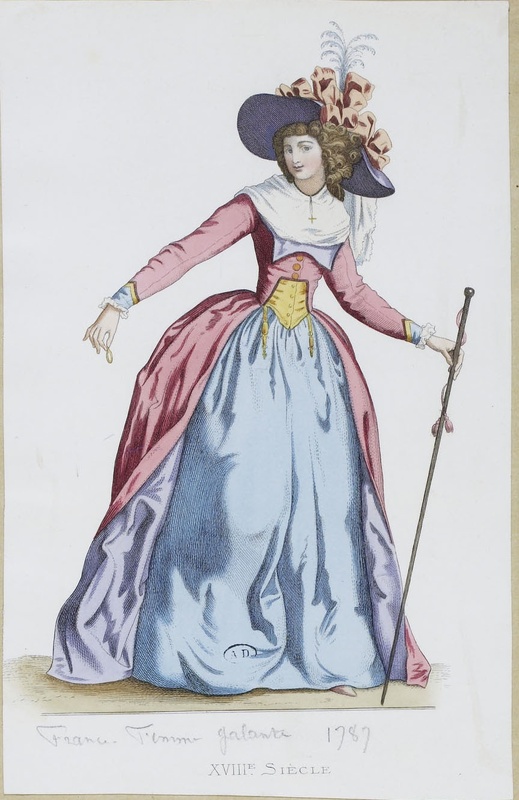 As the original article suggests, this may have been a slightly satirical drawing of a female Macaroni, who were, much like the Incroyables and Merveilleuses of the 1800-10s, considered gaudy, outlandish dressers. 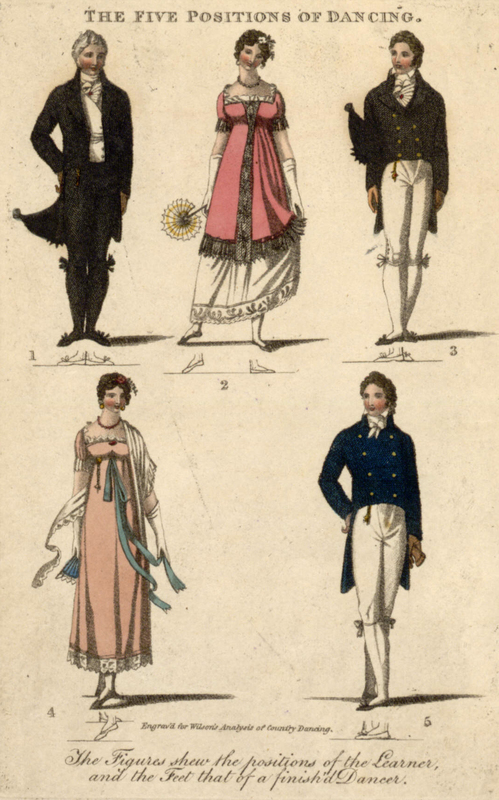 By the time the 1790s rolled around, the style of dress had completely changed. The heavily ornate gold equipages were replaced with longer watch chains for both sexes, though ladies’ watches generally remained daintier. A charming print not just as a dancing reference, but also for all the wonderful watch chains! 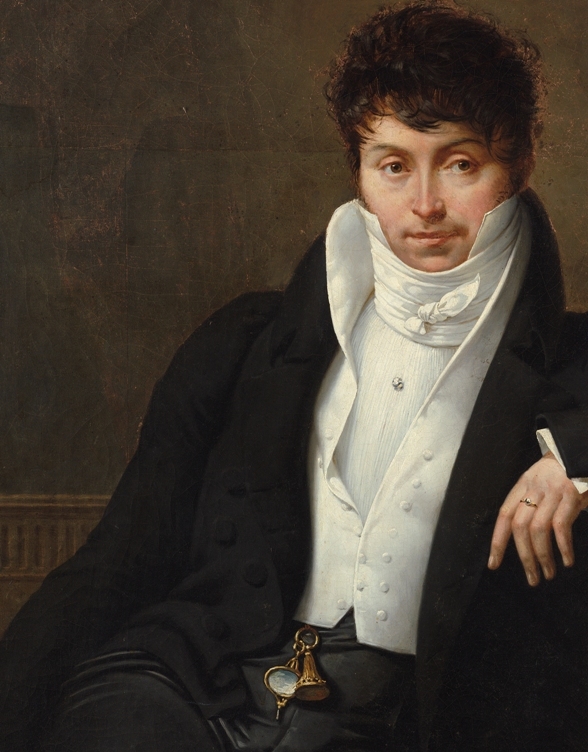 His dress places this portrait close to his death in 1808. The thick, high cravat style (one of the signature marks of a dandy) was in vogue from about 1800-20, and large, showy watch accessories were favorite pieces of jewelry. Men’s watch chains/fobs remained in fashion well into the 20th century, and ladies’ chatelaines remained popular through the 19th century until they were replaced with the lady’s handbag by the 1920s. However, wearing watches on a chain never left. Watch necklaces can still be found and were very popular during the mid-20th century, and continue to be worn today. 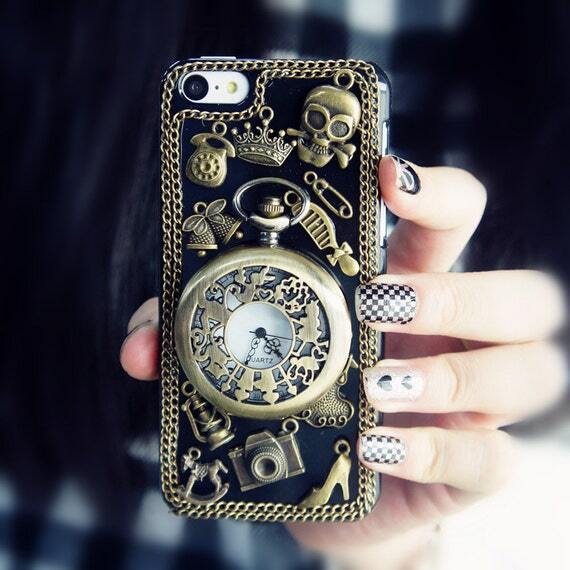 Instead of watches, the smart phone has become the must-have accessory of the 2010s. Much like an equipage or watch string of old, they hold all of our tools in one place for us, complete with fancy cases, accessories, and charms. 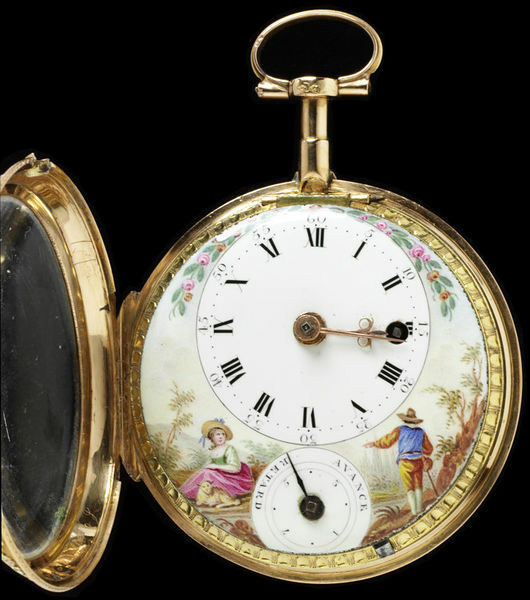 On Wearing Two Watches by the Museum of London – Explores the late 18th century trend for wearing two watches at once by both men and women. 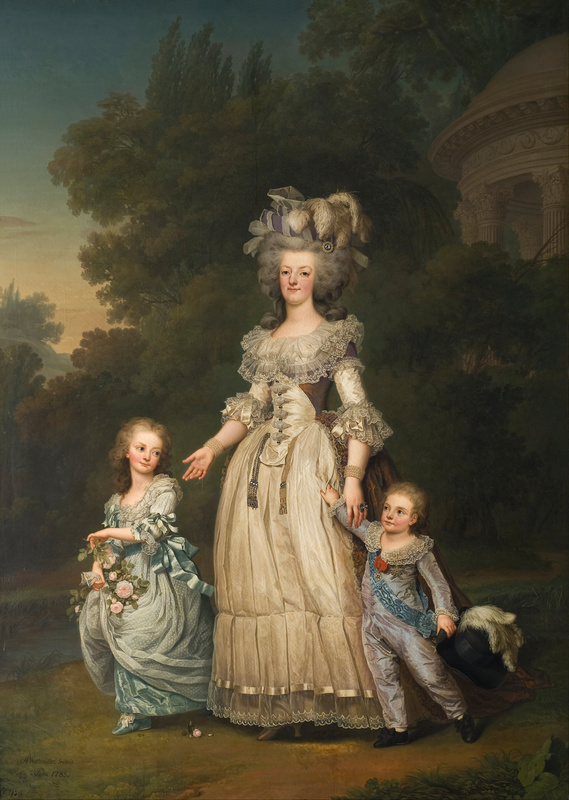 Equipages, Chatelaines, and Macaronis by the Museum of London – Explores ways ladies in the 1780s might have worn the double watch chains. 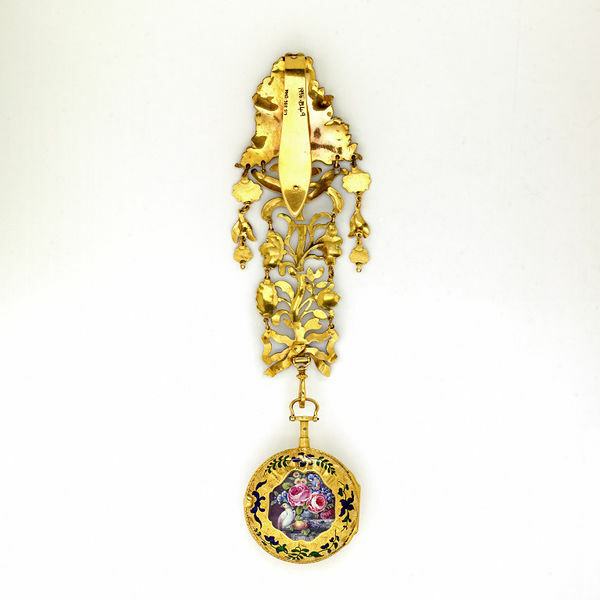 A Watch Fob for My Regency Gentleman by Romantic History – How to make a regency-style watch fob/chain. 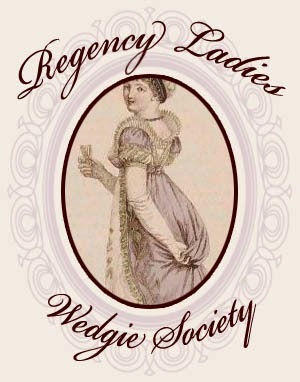 My Mr. Knightly: Making Breeches by Tea in a Teacup – How to make historically appropriate breeches with Simplicity 4923 (including fob pocket) and a wonderful set of research links are included. Cogs and Pieces: Antique Pocket Watches – An online collection of antique time pieces from the 18th century onward and all for sale. How the Watch was Worn by Genevieve Cummins – A rather spendy book, but a thorough one! I don’t have the privilege of owning a copy, but it is considered the premiere guide to historical watch wearing. this is a great collection of chatelaines and equipages! Do you happen to know if they were always worn outside or if there was a possibility to hide them behind the first skirt f Ex. I think how they were worn depended very much on the wearer and the situation. Watches, for example, could be worn under the skirt for safety purposes, especially while traveling. Since watches were luxury items, however, folks liked to show them off. Wearing an equipage under the skirts would make accessing it more difficult. Most equipages/chatelaines were specifically designed for quick access. However, I see no reason some ladies might wish to have them hang inside a pocket so the tools would still be accessible, but no swinging around as they worked. Sounds quite logical. I was thinking of how they wore them when travelling or working. But now it seems more clear. Thank you! Thank you very much for all the information and details provided.